Home appliances have become integral part of modern lifestyle. On an average, Middle East and Africa (MEA) household own six appliances. The population growth, technology and appliances penetration, people purchasing patterns, lifestyle trends of the people are some of the impacting factors on the demand and supply chain of home appliances. Home appliance user penetration was 6.1% in 2017, which is expected to reach 9.3% in 2025. Major players manufacturing home appliances such as Panasonic Corporation is establishing manufacturing hub in India and Japan, in order to cater the Middle East and African market through its penetration strategy entitled ‘makers of quality’, strategic alliance with key retailers. MEA region has low value and volume of home appliances, but it is anticipated to be second fastest growing region in future, becoming a hotspot for home appliances industry. MEA has lowest personal disposable income, but the region has world’s top richest countries, thus opening scope for penetration of home appliances accompanied by rising personal disposable income. Goldstein Research analyst forecast that the Middle East and Africa home appliances market size is set to reach USD 3,957 million by 2025, growing at a CAGR of 13.1% over the forecast period. The technological penetration, personal disposable income, urban growth and development, export and import policies, growing oil and gas industry, are some of the factors affecting the growth of Middle East and Africa home appliances market. The report covers the present ground scenario and the future growth prospects of the home appliances market for 2017-2025 along with the Middle East and Africa sales and Middle East and Africa revenue of the home appliances. We calculated the market size and revenue share on the basis of revenue generated from major players across the globe. We have forecast the market on the basis of home appliances manufacturers, supply chain. On the basis of product type, major home appliances accounted for the largest market share of 54.6% in 2017 of the total MEA home appliances market. Major home appliances are used like the backbone of a household works that offers comfort and assistance for the household aesthetic and management. Online distribution channel of home appliances is the fastest growing segment at a rate of 6.2% annually on account of the rising awareness among the people towards advanced and convenient buying platforms. Middle East and Africa Home appliances market outlook 2017-2025, has been prepared based on an in-depth market analysis from industry experts. The report covers the competitive landscape and current position of major players in the home appliances market. The report also includes porter’s five force model, SWOT analysis, company profiling, business strategies of market players and their business models. Middle East and Africa home appliances market report also recognizes value chain analysis to understand the cost differentiation to provide competitive advantage to the existing and new entry players. There is a rising trend of smart technology based home appliances such as smart refrigerators, smart air conditioners, smart security alarms and more. Smart home appliances have penetrated 10.6% of the MEA home appliances market and positively impacting the growth of MEA home appliance market. MEA construction industry is growing at a rate of 18.7% annually. The growing construction activities and rapid urbanization in MEA region attracts buying and installation of home appliances, being the major driving factor for the growth of Middle East and Africa home appliances market. The political and economic conditions of MEA region adversely impact the home appliances market. Growth of MEA in 2017 slumped down to 1.8% from 5% in 2016. Slowdown in growth of oil exporters, on the back of oil-production cuts and geopolitical tensions, negatively impacted the economy of the region, hence the home appliance market. Based on geography, South Africa accounted for largest market share in 2017 of the total MEA home appliance market. GDP of South Africa was USD 294.8 billion in 2016, higher than other regions, evidencing the major sales and revenue region of home appliances market. Djibouti home appliance market grew at a fastest rate of 8.6% annually, on the back of stable economy in 2017 among all other countries in Middle East and North Africa. 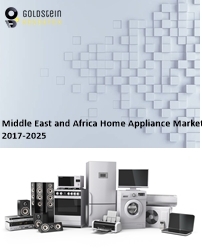 Middle East and Africa home appliances market report comprises of the following companies as the key players in the home appliances market: Samsung Electronics, Haier Electronics Group Co. Ltd, LG Electronics, Panasonic Corporation, Whirlpool Corporation, Electrolux AB, Arcelik A.S, Defy Appliances (Pty) Ltd, Godrej Group, Viking Range, LLC, Amica S.A., Candy Group. What is the revenue of home appliances market in 2016-17 and what would be the expected demand over the forecasted period?